Crown rot is a disease caused by a soil-borne fungus which can be active in soils indefinitely. Wet humid weather is mainly to blame, and symtoms vary from plant to plant. Most symtoms go unnoticed until it's too late. Rotting may appear on one side or only on lateral foliage at first, then eventually spread to the rest of the plant. Diseased areas may appear discolored, usually tan or dark colored, which is an indicater of dead tissue. As crown rot progresses, the plant will begin to wilt and quickly die. Prevention is key, due to the fact theres usually not much that can be done to save the plant once diseased. Remove infected plant. Replace area of soil about 8 inches deep and 6 inches beyond the infected area. Correct any drainage issues. The use of fungicides will also help to control crown rot. 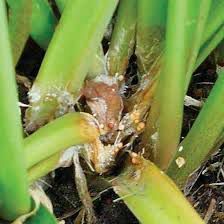 The pic shown is an example of an infected plant and the fungi causing the damage.